I had a recent conversation with a fellow reviewer who made a good point about gaming disappointments: the worst ones are rarely those that are actively bad games. I want to make sure that’s clear right off the bat: I Am Setsuna is not a bad game. To me, though, the fact that it is merely good — not great or excellent — let me down perhaps even more than if it had been outright awful. That might sound strange, but it’s true; there’s nothing quite as maddening as watching a game fall just short of its full potential in a bunch of areas. I still loved its nostalgic, comfort-food-esque JRPG trappings and gently beautiful presentation, as I’m sure many other players will, but I couldn’t help but feel just a few important changes could have brought Tokyo RPG Factory’s first project over the top into classic territory. When I spoke to I Am Setsuna’s developers at E3, the prevailing message was that the game is meant to invoke the feeling of setsunasa in players — a distinctly Japanese emotion roughly translated as a combination of sorrow, loneliness, heartbreak and nostalgia. The team really succeeded in making that vibe evident right from the start, too; I can’t remember the last time I felt a game’s presentation was this committed to its themes. From the moment I saw the colorful snow-covered trees and heard the somber piano of Tomoki Miyoshi’s score, I knew I was in for something special and different. Indeed, this is one area where I can offer near-universal praise and say with surety that many players will never have experienced anything quite like this before: the soundtrack, entirely made up of piano compositions, is heart-achingly beautiful, and toi8’s gentle art style graces all the characters and environments with a light, wintry touch. Stay Away from the Summoner Sacrifice! Once you get into the narrative, the feeling becomes even more prevalent. In a plot that will no doubt remind Square Enix fans of Final Fantasy X, the world of the game has found itself in a state of perpetual winter and under attack by hordes of dangerous monsters. The title character, Setsuna, is one of a series of sacrifices who has decided to give up everything for a pilgrimage to the Last Lands — where, in exchange for her life, the monsters will temporarily slow down their assault. Right before she’s scheduled to take off for her journey, an assassin named Endir comes to prematurely take her life. His attempt fails, and he later has a change of heart when he saves the city from a monster attack and gets personally asked by Setsuna to be part of her guard. From there, it’s pretty well-worn territory: Endir, Setsuna and pal Aeterna go journeying from one town, field and dungeon to the next on their way to the Last Lands, gathering up some more party members and solving some people’s problems along the way. I really enjoyed I Am Setsuna’s cast for the most part. They’re a truly adorable bunch of troubled folks trying to make life worth living in a world full of despair, and they don’t feel as shamefully archetypal as some characters in JRPGs do. Unfortunately, their stories aren’t particularly deep or surprising; at some points, the narrative felt like it was checking off obligatory boxes on a list of JRPG tropes. People doing ludicrously horrible things with the right intentions? Yep. Betrayals or alliances with characters who seemed overly nice or mean, respectively? Both are accounted for. Stopping at each town to solve a new party member’s problem, who you know will join your team eventually because they’re the only people graced with character portraits? Three times. None of these things are terrible, of course, but they do make the overall story feel more derivative than original. I was really hoping the game would throw me a curveball or two, but most of the story beats can be felt rumbling about a mile away. That’s not at all true when it comes to the combat, though. 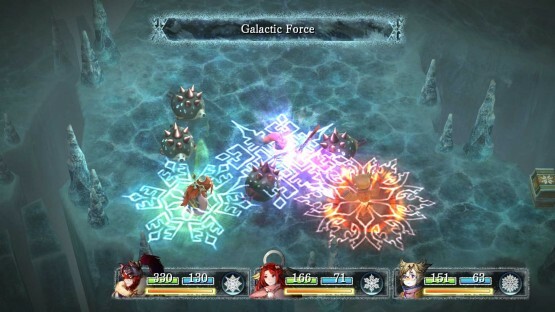 Yes, you’ve probably seen how it takes obvious cues from Chrono Trigger, but I Am Setsuna puts three unique spins on familiar turn-based battling that are just plain refreshing in the face of genre stagnation. First of all, there’s the Momentum system: once your character’s ATB meter is charged up, a second meter (indicated by a snowflake icon that’s different for every character) begins charging. Letting it fill will net you up to three Momentum points, which can then be used by hitting the square button with good timing to add various benefits depending on the skill used. For example, using up Momentum with a Fire spell adds additional magic damage, while using it with the Blunt Blow attack will recover your party members’ health. 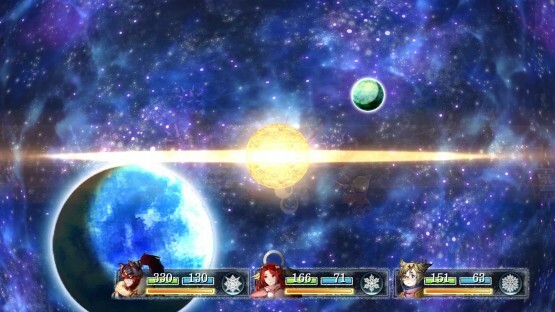 Using Momentum can also randomly trigger Fluxes and Singularities, of which the former add properties to your Spritnite (basically this game’s Materia) and the latter trigger various “field conditions” that temporarily alter the flow of battle (for example, one Singularity makes it so your characters will never go below 1 HP, granting you a brief reprieve from death). On top of all that, there are special Combos that certain party members can perform if two or three of them are active and equipped with the right Spritnite. It might all sound complicated, and indeed, the game doesn’t do a great job of explaining it all right away (I couldn’t for the life of me figure out how to trigger a Flux or what it would even look like, until I realized they were completely random). Thankfully, it’s all pretty simple and intuitive when it really comes down to it, so chances are you’ll have it all figured out after an hour or two. And once you’ve got a number of party members and a handful of Spritnite to play around with, it’s a real pleasure to experiment with different combinations and learn how to smash through large groups of enemies with ease. I spent a lot of time in dungeons whipping through battles at breakneck speed, taking advantage of attacks that hit multiple enemies at once. Plus, doing well in battle actually has a benefit besides saving you time — killing enemies in different ways (such as “Debuff Kills,” which occur when you take out an enemy who has an active debuff, and “Momentum Kills,” which are triggered by kills from Momentum-boosted attacks) yields more materials, which can then be sold to Magic Consortium Members to gain money and unlock more Spritnite. Of course, I mentioned right from the start that the game was a bit of a disappointment for me, so let’s get right into some of the reasons for that. First and foremost, I have to be honest: I am so sick of games that use nostalgia as a main draw without modernizing their systems. Just because it worked for games in the ’90s doesn’t mean it works for games now — and I can’t say this enough, being forced to lose progress because of infrequent save points is not fun. People often say that save points are part of the “challenge,” but I’m not sure how forcing people to replay sections of the game they’ve already cleared makes things harder. Not to mention that, as in so many other JRPGs inspired by relics of the past, dying in this game often comes when you’re blindsided by a cheap enemy attack or boss that feels like trial-and-error is required. I spent quite a bit of the final half of I Am Setsuna grumbling, swearing and just feeling unpleasant, which is why it’s hard to give it more than a cautious recommendation. That, and things start to feel a little thin by the time you’ve figured out the game’s patterns. In addition to totally predictable story beats and gameplay repetition (walk through a basically empty world map, explore a town, go find something, then go back to the town to help someone), things take a turn for the lame in the very last act — which stops you just short of your goal to initiate a quest line with dull backtracking that feels like filler. And while I may have complimented the art design, it’s worth noting that the lack of variety started to wear on me after so many hours of looking at the same assets repurposed for different towns and dungeons. It did give things a bit of a bleak feeling, but I’m not sure it’s in line with the setsunasa feeling the developers were going for. It might be a good idea to spread out your time with the game rather than playing it in long sessions, like I did, but I can’t help but feel like the third act all ran together for me without many of the memorable or iconic moments you’d expect from a JRPG. I Am Setsuna is bold in the way it explores its themes, and it immediately moved me with its soft art style and beautiful piano score. I also really enjoyed the battle system’s Momentum, Flux and Singularity elements, which added some much-needed variety to the otherwise standard turn-based combat. Unfortunately, a few major problems kept the game from remaining entirely enjoyable as the experience went on. Cheap deaths at the hands of superpowered enemies sent me back to a save point, losing me valuable time, on more than one occasion — an infuriating and needless flaw, given that other retro-fueled titles like Bravely Default include optional autosave. As I was getting to the end, I also started to feel like everything was blurring together, between the reused assets and the predictable structure. Overall, the cumulative effect of the game’s themes is still a very powerful one, and I enjoyed most of my time with it, but I can’t help but feel a little let down by the flaws that kept it from reaching its full potential. Review code for I Am Setsuna provided by publisher. Reviewed on PlayStation 4. For more information on scoring, please read our Review Policy here.